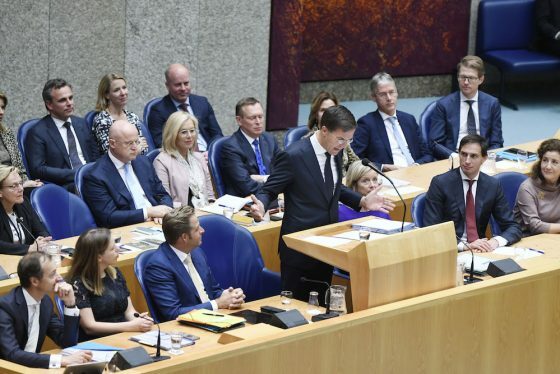 The new Dutch government will press ahead with its plan to scrap the tax on dividends which will mainly benefit foreign firms, prime minister Mark Rutte said on the second day of debate on the government’s plans. Rutte refused to go into details about how the decision to scrap the tax, which will cost the treasury €1.4bn, was taken. It did not appear in the election manifestos of any of the four parties involved in the new coalition. The opposition parties claim there is no evidence that large multinationals were considering leaving the Netherlands because of the tax. However, employers organisation VNO-NCW had included the measure in a list of demands it made while the cabinet formation process was underway, website Nu.nl reported. Rutte was centre stage on the second day of debate on the new government’s plans. He began his defence of the centre-right administration’s policies by rejecting criticism levelled at three ministers by PVV leader Geert Wilders. Rutte described the fact that two ministers in the cabinet have dual nationality as ‘irrelevant’, saying that having two nationalities is no reason to doubt someone’s integrity. He also brushed off Wilders’ criticism of new justice minister Ferdinand Grapperhuis. Wilders had said Grapperhuis was unsuitable for the job because he had said several years ago that jihadis should be allowed to return to the Netherlands. Rutte said Grapperhuis is completely behind the coalition agreement. ‘If people are contaminated because they once said something that is not in line with the policy of a new cabinet than you are making it impossible for them to say anything in public,’ the prime minister said.